My daughter was invited to another 5th birthday party today, a good friend of hers from daycare. This is the card we made for the birthday girl! The card was inspired by Angela Sargeant’s card here. Thanks, Angela! I’ve based the card in Pretty in Pink and used the Berry Bliss DSP. The stamp set is Big Bold Birthday and I’ve embossed the cupcake icing and ‘5’ with Heat and Stick and Dazzling Diamonds. The ‘5’ comes from Best Friends Numbers – I think I use this stamp set for every kid’s birthday card I make! I also used my versamark ink pad with silver embossing powder to stamp “make a wish”. And, of course, I had to use my Stamp-a-ma-jig to line up the words “make a wish”! What a wonderful tool the stamp-a-ma-jig is! I then bordered “make a wish” with Styled Silver Hodgepodge and white taffeta ribbon. The above photo (with the flash) shows the embossing better. Whereas, this photo (without the flash) shows the true colour of Pretty in Pink. These bookmarks are one of the free give aways I made for my Summer Mini and Sale-a-bration Launch party. Everyone got to take one home. I used the lovely stamp set, Live Your Dream, for the flower on the front and back of the bookmark. I coloured the flowers with my marker pens using the rubber to marker pen technique. Then I used a rhinestone brad for the centre of the big flower. The wide grosgrain ribbon is Old Olive and is tied at the end with a knot and a piece of hodgepodge. Now is the perfect time to get organised for the year ahead. And what better way than to make some baby cards? There are so many gorgeous bubbas being born at the moment … why not give a new Mum and Dad and special, handmade card to keep for their newborn? I am having a baby stamp-a-stack card class on Friday 30 January 2008. Come along to my house and make 10 cards – 5 boy designs and 5 girl designs. Bookings are essential, so email me today! Well, it’s 2009 and it’s time to put up a calendar or two! These are calendars I’ve made recently and they were so easy to do (thanks to how easy it is to coordinate SU colours). I will have to make some more! Everyone who came to my Summer Mini and Sale-a-bration launch party received one to take home for free too. I’ve used the Bali Breeze DSP available in the Summer Mini catalogue out now … and Eastern Blooms coordinates with it perfectly. They were made for each other! I’ve added some lovely SU ribbon and accessories and that’s it! This colour combo for the stamped flowers and ribbon is Chocolate Chip and Taken With Teal. This colour combo for the stamped flowers and ribbon is Chocolate Chip and Purely Pomegranate. This colour combo for the stamped flowers and ribbon is Chocolate Chip, Purely Pomegranate and Taken With Teal. This colour combo for the stamped flowers and ribbon is Chocolate Chip and Groovy Guava. I really love the simplicity and elegance of these two cards. They were great fun to make because I used the masking technique and the way I’ve attached taffeta ribbon is clever, yet it is so easy to attach that even a card-making beginner, who may find it challenging to look upon, would find it simple to do. I think these would be great cards for a “make and take” or a “stamp-a-stack”. I’ll be using them as “make and takes” on the weekend and I’m sure they’ll be a hit! The stamp sets I’ve used are All Year Fun to decorate the balls with lots of Dazzling Diamonds and Short and Sweet for the message “Welcome Baby”. 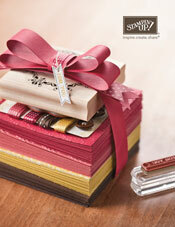 Short and Sweet has to one of the most versatile and useful stamp sets I have! I love it! This is the third card we made at my Summer Mini and Sale-a-bration Launch Party tonight. The card used only one stamp set, In the Stars, from the Summer Mini. I thought that was pretty good ;). The lovely Rose Red 1″ wide grosgrain was folded over at the top and stapled on (although we covered it with a Lovely Lilac button on the night – I love the ideas inspired when we get together and create! ), and the ladies were able to pick a rhinestone brad to replace the “o” in “you”. It was a fun night … and surprisingly not too late! Thanks to everyone who came along. Here is another make-and-take card we will be making on Monday night at my Summer Mini and Sale-a-bration launch party. I adore the classic colour combo of Real Red, Chocolate Chip and Sahara Sand on this card. The card was inspired by a stunning card made by Me, My Stamps and I and posted on SCS here. Thanks for the inspiration! The original card is made with Riding Hood Red … a colour we don’t have in Australia yet, but which we will get in April when our new Catalogue is released. Can’t wait! The stamp sets I have used are Eastern Blooms and Everyday Flexible Phrases … and Dazzling Diamonds to sparkle it up!